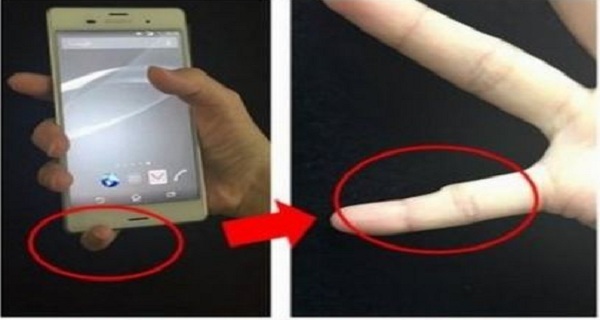 This Is What Will Happen to Your Pinky Finger If You Are Holding Your Smartphone Like This! If you are using your cellphone often then you must read this text! We already know that looking down at the smartphone overloads your spine as well as your eyes. We also know that cramping and soreness in the wrist, fingers and forearms can be due to overuse of cell phones. But are you aware that using your pinky to hold your cell phone can cause temporary pain or even deformity of the pinky finger? Japanese cell phone provider NTT Docomo warned the users via Twitter about deformity known as ”smartphone pinky”. It appears due to using the little finger to support the weight of your phone. When you hold a bigger smartphone in your hand, it makes a pressure on the inside of your end pinky joint which causes pain. Rocket News24 warns that by doing this very often it may lead to the development of an “indentation between the first and second joints of your pinky”. You can also try to type on your phone after you put it on the table as you won’t burden your hand in this way. – Apply heat or cold compress on the painful area. Cold compress is a better option because heat can cause swelling and more pain. – Stretch your hand back and pull your fingers gently towards yourself while your arm is turned upside-down. – Massage the tightness and nodules. Use your fingers and press down on the forearm, moving up and down to search for nodules. They occur when the muscles go into spasm. – Stretch your arm out and extend the hand backward, stretching the muscles. – Stretch on your own by putting your hands together in a prayer-type gesture, and hold it for a few seconds. – Bend your hand forward. Turn your wrist down and pull your fingers down and toward yourself.